To understand how Indonesia’s cellular telecom industry shapes up, it would be beneficial to get a quick intro on the history. Telecommunications services (fixed line, long distance, and cellular) in most emerging countries is generally a highly regulated industry due to the strategic importance of telecommunication services on a country’s economic development. The government through its various departments regulates the industry by issuing licenses, allocating spectrum, determining tariffs, imposing taxes and fee on frequency allocation, and requiring operators to contribute some portion of income on development of telecommunications systems in remote and rural areas. Before the Asian economic crisis in 1998, all telecommunication services in Indonesia were provided by 2 state owned enterprises, Telkom and Indosat. Telecommunication services responsibilities were split between these 2 entities. Telkom owned fixed line network including Public Switched Telephone Network (PSTN) and Domestic Long Distance (DLD) service. Indosat was given the responsibility to operate the satellite network and International Direct Dial (IDD) service. Around year 2000, the new democratic Indonesian government wanted to encourage more competition and sped up the development of national telecommunication systems (Indonesia had its version of Arab spring in 1998 that resulted in the fall of President Suharto who ruled for 30 years). As a result of the new regulation, these 2 entities lost their monopolistic rights and other players were allowed to enter the market the telecommunication services market. The industry also adopted “calling party pays” system that requires the originator of telephone calls to pay for calls. This created further catalyst for ownership of cellular phones because people can receive calls and communicate with the calling party without paying anything. Fast forward to 2012 today, there are 8 mobile operators with combined 220m+ subscribers (out of 240m population). Telkom is still the most dominant telecommunication player and is publicly traded with Indonesian government owning ~50% of the shares plus special veto rights. Telkomsel, the number one cellular operator in Indonesia, is also jointly owned by Telkom (65%) and SingTel (35%). Indosat is also publicly traded and Indonesian government owns 15% of the company. Indosat’s majority shareholder is Qatar Telecom (QTEL) with 65% ownership. Telkomsel, Indosat, and another successful provider, XL, own 75% of the cellular subscribers in Indonesia. There are additional 30m+ subscribers of fixed wireless service with Telkom (in addition to Telkomsel, Telkom also owns separate fixed wireless CDMA network) and Bakrie Telecom dominating the fixed wireless market. 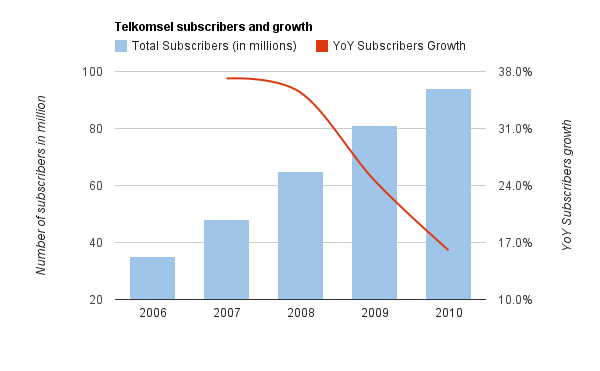 Looking at Telkomsel as the anchor, subscribers have grown at 28% CAGR from 2006 – 2010 with growth declining in later years as market reaches saturation point for voice. The new regulation in 2000 that opened up competition in the industry has done fairly well with respect to what the government wanted to accomplish.